Nice bitumen drive along Thunderbolts Way from Gloucester (last fuel and shops) to turn off to Baxters Ridge Trail. Before turning into Baxters Ridge Trail, continue to drive north for about 3 kms and stop at lookout on left. Great views to the west over the valley. Return to Baxters Ridge Trail. Trail is good quality gravel road (main logging track), with occasional mud holes after rain and follow trail for about 7kms until the first turn off to the left. This is Obergs Trail. It will probably not be sign posted. Follow steep trail down to river, passing old cattle yards and timber stacks on the way. Do not turn off the main trail. The trail is steep in parts and crosses a small creek near the bottom of the valley. At times the trail can be difficult to follow for about 100m as it tightly winds to the right and up a short incline. At the time the trail was easy to pick back up. At the end is a short steep decline through lantana onto a river flat. 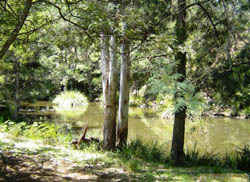 In the past this area has been like a lawn, with great camping by the Nowendoc River. Occasionally cattle will wonder by, as this was an old grazing areas. Platypus are often seen in the main pool at anytime of day. This has recently become part of the Giro National Park, but access was still possible Easter 2008. See Photograph.